» Huge Amethyst Geodes Collection! Brazilian Amethyst is some of the most prized Amethyst in the world. Amethyst often occurs as large geodes within the volcanic rocks of Brazil. When you see a large collection of these Amethyst geodes, like in the video below, they look very impressive! Amethyst was used as a gemstone by the ancient Egyptians. The Greeks believed Amethyst gems could prevent intoxication. Christian bishops and kings wear an Amethyst ring as a sign of power and divinity. The healing properties of Amethyst including attracting love, increasing spiritual connections, and healing old emotional wounds. 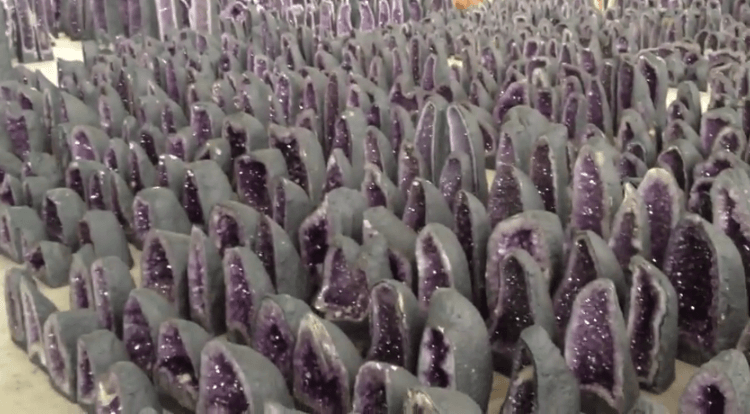 As you watch the video below, imagine being in the same room as all those Amethyst geodes! This video was taken by Little Gems Rock Shop during a trip to Brazil. It shows a collection of Amethyst geodes that will blow your mind!